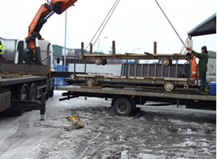 Hiab vehicles that provide self loading and third party loading. In addition all consignments are monitored, to enable telephone status reporting at all times. We offer a freight forwarding service for out of town companies who get stuck with the odd pallet and need to free up a vehicle. 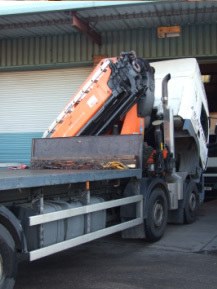 We can accommodate most consignments and can tranship most loads. We also offer a full trailer delivery option so you can drop off your trailer, we can deliver or load it for you then you collect your trailer at a time to suit you. 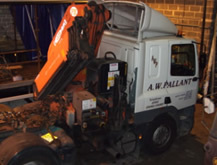 We also offer a short term storage option for most consignments. 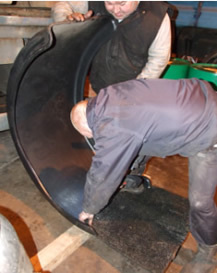 We have an onsite extensively equipped workshop, this provides essential support to the transport function, ensuring efficient use of every vehicle and trailer and provides maximum vehicle availability. In addition to the legal requirements for servicing and inspecting vehicles, all our vehicles are regularly inspected by our fitters, the hiabs benefit from a daily safety check from our garage purely due to the nature of the vehicles and the amount of work they carry out. We also have a plant trailer and can assist in recovery in some cases.